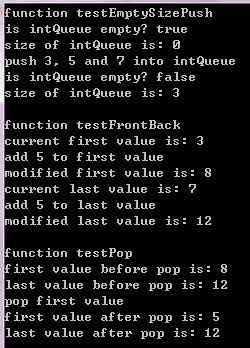 /** Test basic operations of queue. *        one end of the container and extracted from the other. *        pushed into the "back" of the specific container and popped from its "front". *        Returns whether the queue is empty: i.e. whether its size is zero. *        Returns the number of elements in the queue. *        Adds a new element at the end of the queue, after its current last element. *        The content of this new element is initialized to val. *        Removes the next element in the queue, effectively reducing its size by one. *        retrieved by calling member queue::front. *        the queue and the same element that is popped out from the queue when queue::pop is called. *        the queue (i.e. the last element pushed into the queue).